In what looked like a series of equations, Jim Davis scribbled numbers and letters across a whiteboard at Lafayette High School. This wasn’t Algebra. Or any high school math class, for that matter. The formulas on the board revealed strategy in the game of bridge, and the eight students in the classroom listened before launching into a few games of their own. 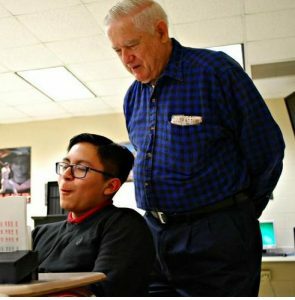 Davis, 73, teaches the card game to nearly 80 students across eight Williamsburg-James City County schools. Hello. My name is Cathy Pegram, and I am interested in learning to play bridge. Do you offer beginner lessons? I’ve never played before and know nothing about the game. Beginner lessons are at the Bridge Center on Sunday evenings at 6:30. We will start up again in March, and I’ll announce the date on this website. Email me at linda@richmondbridge.net for more information.